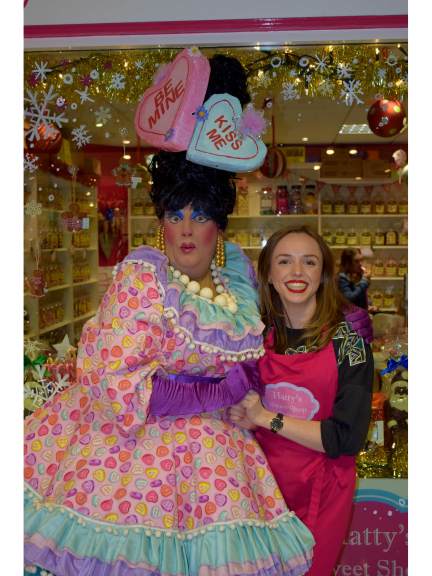 Beauty and the Beast pantomime dame Mark Hudson took time out of his busy Epsom Playhouse rehearsal schedule recently to visit Hatty's Sweet Shop in The Ashley Centre. Mark said: "When I heard there was a proper sweet shop in Epsom I couldn't wait to put on my sweetie dress and pay them a visit. Harriette the owner was rather surprised when I popped in, but very pleased to see me! I was delighted that my outfit didn't clash with the shop's colour scheme, well you never know and a clash could have ruined my look!" Beauty and the Beast stars TV presenter Rav Wilding, Holly Atterton from Nick Jr's Go Go Go and Britain's Got Talent finalist Sam Jones and opens at the Epsom Playhouse on Sunday 13 December. Tickets from £12.50 are on sale now from www.epsomplayhouse.co.uk or by ringing the Box Office on 01372 742555.